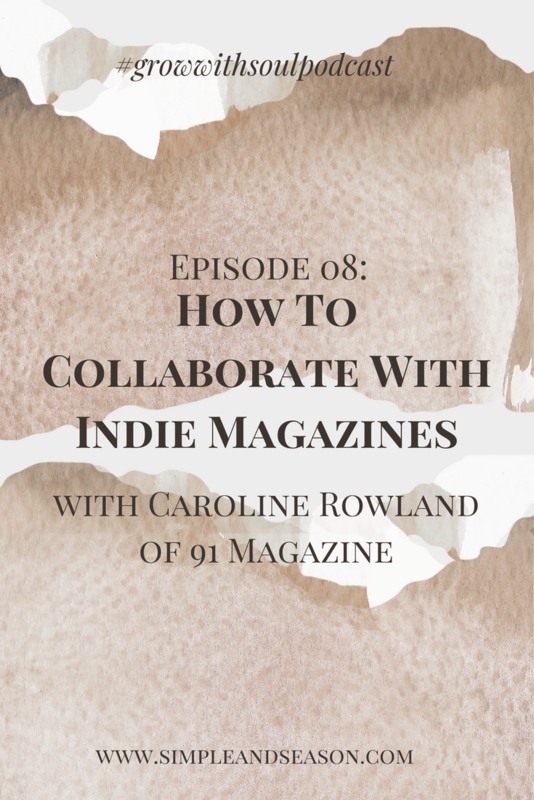 Like so many creative businesses, 91 Magazine began as what is often referred to these days as a ‘side hustle’. I was working full-time for a newspaper when the idea for creating my own magazine struck. Less than two years later I quit my job to pursue my own publishing path. I have no idea how I managed to juggle it all, and I seriously wish I had had the following post to guide me as there is a wealth of information about planning and managing your time when you are juggling a job and a personal project. Planning & productivity coach and podcaster Josephine Brooks shares her top tips for growing your side hustle in your spare time. The driving force behind building my business on the side of a 9-5 has always been to create the lifestyle I long for with the freedom to do more of the work I love, to live a slower and more meaningful lifestyle and to reduce my work hours. It’s exactly the same motivation for the side-hustlers I work with, it always boils down to seeking freedom. On the steep learning curve that was my side-business journey, I learned that making these dreams a reality takes planning and careful time management. For me this looked like getting serious about my side-hustle as a business. I learned how to plan more effectively and be smarter with my time. I used my project management skills from my 9-5 to develop more effective ways to grow my business within the limited time I had. After a couple of years of constantly going full speed, feeling stressed and reaching the point of burn out I discovered that productivity and managing your time as a side-hustler doesn’t need to be about being busy or striving to get lots done every day. It’s about doing less and focussing on the most impactful tasks. Let me take you through a few of the time management and planning tools I’ve used to grow my business in a sustainable way, on the side of a 9-5. My to do lists used to be endless scrawls, as soon as I’d have completed one task I’d add two more to my list, and it was demoralising. Now I have a few go-to tools that help me keep my to-do lists under control. Remove tasks from your list – This is one of the first things I cover with my clients. As I mentioned earlier, productivity if often about doing less and just focussing on the most impactful stuff. So, if there’s anything on your to do list that’s either not necessary or not having a big enough impact on your business, take it off your list. Another thing to look out for is if you’re doing tasks just because you feel you should, because someone told you that’s what all the successful people are doing. Take those tasks off your list. Use your gut instinct and be really honest with yourself - what's on there that isn't an impactful task, what’s on there that doesn’t feel right for your business? The 2 minute method – This is one of my favourite tools and it’s so easy. Have a look at the actions on your to-do list, are there any actions that could be done in two-minutes or less? I often find myself putting off actions that would only take a couple of minutes just because they're not my favourite tasks. Often, it's replying to an email or tweaking something on my website. Put a star next to those 2-minute (or less) jobs and action them right away. Must do and could do - Try splitting your daily to-do list into ‘must do’ and ‘could do’ and make sure you’re not putting any more than three tasks into the ‘must do’ list. This will not only help you tackle the more important tasks first but also give you more chance of getting to the end of your to-do list and reaching that feel-good factor. Organising my weeks ahead of time is now a habit I heavily rely on because it avoids wasting any time in the week thinking about what to do next and it prevents me from going off after shiny new ideas and losing my focus on the impactful stuff. Plan out your weeks in advance - I like to plan for the week ahead every Sunday evening and it only takes about 10 minutes. I use a weekly planner to plot out when I’ll work on my tasks for the week. The benefit of doing this is that you know exactly what you need to do that week and you won’t be wasting time and mental energy deciding what to work on, you can get straight to it. Block out your time - If you use a weekly planner or diary for your side-hustle, cross out the hours you’ve already committed to things like work, school runs, socialising etc. This will give you a visual representation of how much time you’ve got left to dedicate to your business and help you plan more realistically. Don’t forget to leave some time for YOU to switch off and recharge as well. Create a new habit - If you struggle to make the time for your side-business, create a habit of working on it at the same times each week. Perhaps it’s putting every Wednesday and Thursday evening, or every Saturday morning aside for your side-hustle. By creating a habit of working on your business at set times it’ll start to become second nature. At the end of March 2019 I’ll be taking my side-hustle full time, which is terrifying and exhilarating in equal measure. But none of this would have happened without some careful planning. I developed my 3-step planning method over the last 8 years of side-hustling and it’s been the biggest game changer when it comes to making the best use of my time. There are three main components to my 3-step planning method. Finding your focus - It’s tempting to dive straight into the planning but by taking the time to reflect first on what lifestyle and business you’re building as well as what’s gone well and what you’ve learned from over the last few months can quickly help to clarify where your focus needs to be moving forwards. Making a 12-week plan – I like to plan in 12-week chunks because it's a whole lot less overwhelming than planning for a whole year. A lot can happen over 12 months which could throw you off course and leave you feeling disappointed that you’ve strayed so far from your plan. By planning in 12-week chunks you can pivot and adapt your planning throughout the year to react to those curve balls that inevitably appear. Get motivated – A big part of staying motivated and achieving your goals comes from having a support network. For me this has come in a few forms; setting up an accountability partnership with a business buddy, working with a coach, joining communities online and going to workshops and in-person events. Reach out to those fellow side-hustlers you always find yourself chatting with on Instagram and ask if they fancy meeting for a coffee. Look for Facebook groups, find a coach or sign up to workshops and events. The connections you make will start to form a support network around you that you can fall back on when you get stuck on a decision or when you’ve had a tough week. I can’t sign off without a mention to making time for YOU as well. I know from experience how self-care can easily take a back seat when you’re already juggling multiple commitments and a business. The irony is that when we take time out for ourselves to recharge we come back to our work with the energy and mindset to be more productive. After feeling burned out and struggling with anxiety over the summer of 2018 I realised I was waiting until I was ‘successful enough’ ‘big enough’ ‘earning enough’ to make the time for my own self-care. The problem is, what is successful enough, earning enough or big enough? These weren’t very quantifiable, meaning that I never reached those destinations and my self-care constantly sat on the waiting pile. This was not a sustainable way to build a business. This is an area I’m very much still working on myself. I now try to make self-care part of my weekly schedule and I’m working on creating daily habits that make time to get out for a walk, to meditate for 5 minutes and do something as simple as enjoy a slow cup of tea in the garden before I start work. Essentially, I’m working on not reaching for a destination and instead enjoying the journey and making the time to recharge myself along the way. If you’re also putting your self-care on the waiting pile I urge you to make it a priority and schedule in some time for YOU this week. As I mentioned, growing a business as a side-hustle for me and a lot of others is all about creating freedom and the lifestyle we long for. I think all of us, particularly side-hustlers, are on a journey to improve our lifestyles and do more of what’s most important to us. The starting point is making the time for what we want most. Thank you Josephine! So much important and useful information there! For more help with planning and productivity head to Josephine’s website for blog posts, free resources and to listen to her podcast On The Make.